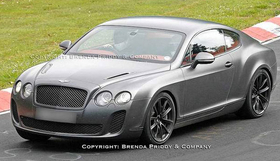 The Bentley Continental Supersports has been spied at the Nürburgring. Bentleys new green car has been spied blitzing the Green Hell. The Continental Supersports, the first biofuel compatible Bentley that also happens to be the fastest and most-powerful production car ever from the British luxury maker, has been undergoing testing on the famed Nürburgring in Germany. Spy shooters have nabbed clear shots of the big two-door, looking exactly like what was revealed at the Geneva motor show. The sheetmetal is curvy and handsome, with four prominent headlights fronting a lengthy hood. The curves continue in the back, where the sleek fenders and sloping roof line meet. But the real menace is under the hood. The Supersports can hit a top speed of 204 mph and makes 621 hp from a turbocharged W12. This equates to a mile time of less than 18 seconds. It can run on either E85 or gasoline, and Bentley wants all of its models to have this capability by 2012. The Supersports will tip the scales at 4,938 pounds. Look for this demon to start at about $250,000. The global launch begins this fall. The E85-capable models will be available in summer 2010 in North America, pending regulatory approvals.